The ideal portable solar charger for everyday use. 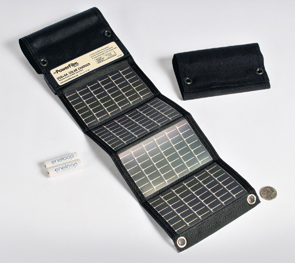 Foldable Solar Chargers are better suited for typically dry environments and must be dry when in use. For marine or wet applications, please•see PowerFilm's line of Rollable Solar Chargers. PowerFilm's USB+AA solar charger works to keep any USB 2.0 compliant device ready to go, is simple to use and easy to pack with you no matter where you go. Compact in design, the charger fits into most pockets when folded, maximizing its portability so you have extra power where and when you need it, 24/7. The PowerFilm USB+AA Solar Charger is equipped with a USB charging port and removable, rechargeable AA batteries. The solar panels are mounted to a lightweight, weather resistant fabric that easily folds and unfolds for use and storage. The AA batteries can be used outside of the charger to power AA battery compatible electronics and in the charger they power the USB charging port. A fully automatic and fast charger, capable of quickly charging all USB 2.0 compliant electronic devices like cellphones, smart phones, iPods• and GPS systems, the USB+AA Solar Charger by PowerFilm, Inc. is perfect for everyday use. • Ultra lightweight - weighs less than 5 oz. 1. The 1.5 watt solar panel charger 2AA (included) batteries in 4 hours or less depending on the charge level of the batteries. 2. The 2 AA batteries in turn provide power to the USB port (the AA batteries must be in the charger for the USB port to function). 3. Using the USB cord from your device, connect the device to the solar charger to begin charging. 4. Place the charger solar-side up in the sun and recharge the batteries for the next time power is needed. 5. Because the solar charges the batteries and the batteries power the USB port you have access to power even during nighttime hours.